The Nevada Gaming Control Board announced today that state gaming revenue had fallen by roughly 10 percent in May based on year-over-year comparisons. In 2011, casinos statewide brought in $984 million. This year, their take plummeted to $885.1 million. 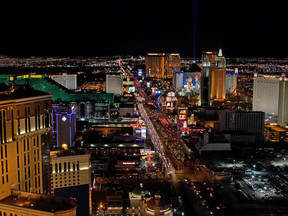 Strip casinos were hit the hardest, falling from $580.4 million to $475.1 million, accounting for all of the decline. Elsewhere, other gaming markets in Nevada did their best to offset the losses. Laughlin reported a dramatic increase of 20 percent, while the Boulder Strip reported a more modest increase of 7 percent. Table games continue to be the biggest problem for Strip casinos and slot machines now make up nearly 70 percent of statewide revenue. As a result of the decline, Nevada will take only $51.9 million in gaming tax for the month of May, which represents a 24 percent fall. The news also affected major casino stocks. MGM Resorts International (NYSE: MGM), Las Vegas Sands (NYSE: LVS) and Wynn Resorts Ltd. (NASDAQ: WYNN) all dropped by about 4 percent. Caesars Entertainment Corp. (NASDAQ: CZR) fell by over 13 percent. I would recommend lowering table limits during off hours or whenever you have table games sitting empty on the casino floor. also need to really promote the free drinks while you play. People are broke and if they are going to gamble they wants some play for their dollars. The Blackjack tables are sooo stacked against the tourist now. With many only giving 6-5 on a blackjack and House always hitting on soft 17...and so on. Plus, the European roulette wheels without 00's are only in high-roller rooms. Many more examples available, but the average player doesn't know or care in most cases. very few food deals left. It only stands to reason that when the things that used to cost very little are now costing loads of cash and the games themselves are becoming less bettor friendly, that the amount of people gambling will decline. The same is happening everywhere. We went to Tunica....few tables with $5 limit or in some cases even $10 on multi bet games like Holdem Bonus and such. In Atlantis in the Bahamas, lowest minimum bet is $15 even during off peak hours...not to mention hotel expenses have tripled. After travelling to Vegas continually for the past 7 years, I have noticed a significant decrease in catering to the average player. The hotel casinos have become elitist at a time when they can't afford to. I suggest that they go back to the basics and cater to the general masses. This will attract a higher volume in the number of gamblers frequenting their casino. A greater volume in people, naturally will attract even more gamblers.